impulse travels. ep309. 15 august 2018.
impulse travels radio. episode 309. 15 august 2018.
all-live-mix episode featuring special guest KUNAL MERCHANT and host DJ LIL TIGER rocking back-to-back House sets. photo: En el anfiteatro (Lyon, 2017). | by Guillermo Moratalla. licensed under a Creative Commons Attribution-NonCommercial 4.0 International License. Our 8/15 episode was an all-live-mix episode, featuring special guest KUNAL MERCHANT and host DJ LIL TIGER rocking back-to-back House sets. You can check out KUNAL’s live Impulse mix below, featuring tunes from Goldcap (Los Angeles), Gilad Kahana + Red Axes (Buenos Aires + Valencia), Dee Montero (Belfast + Ibiza), Massimo Lippoli (Riccione), Nicola Cruz + Bawrut (Ecuador + Madrid + Italy), Mama + Ashley Beedle (UK), Fold + Mall Grab (London), DJ T. (Düsseldorf + Berlin), NTFO (Timișoara), Baile + Sasha (BK) and more. And here’s LIL TIGER’s mix featuring songs from Rocco + Akram + Nativeroots (Lyon), Irfan Rainy + Bonafide Rojas (Manchester + NYC), Morsy (BK + BX), Sara Tavares + Djeff Afrozila (Lisbon + Cabo Verde), Loleatta Holloway + Louie Vega (Chi + NYC), Peven Everett + Koyla (Chi + St. Petersburg), Neighbour + Isis Graham (UK), Sacred Deep (Cape Town), Yasmin + Shy FX + Ms Dynamite + Freemasons (UK) and more. impulse travels. ep308. 08 august 2018.
impulse travels radio. episode 308. 08 august 2018.
featuring a guest mix by TOM M (Amsterdam) + music by Magic Drum Orchestra + Bunty, Kasbo + Tennyson, Te’amir, TOKiMONSTA + Isaiah Rashad + Joey Purp + Ambré + Kingdom, Johnny Faith, Ta-Ku, Birthday Boy + Trish and more. photo: New Orleans. | by Morris Brum. licensed under a Creative Commons Attribution-NonCommercial 4.0 International License. Our 8/8 episode features a guest mix by TOM M (Amsterdam) from Sylvain Labs‘ 8th Anniversary party, plus music by Magic Drum Orchestra + Bunty (UK), Kasbo + Tennyson (Gothenburg + Canada), Te’amir (Los Angeles), TOKiMONSTA + Isaiah Rashad + Joey Purp + Ambré + Kingdom (Los Angeles + Chattanooga + Chicago + New Orleans), Johnny Faith (Melbourne), Ta-Ku (Australia), Birthday Boy + Trish (Toronto) and more. impulse travels. ep307. 01 august 2018.
impulse travels radio. episode 307. 01 august 2018.
featuring music from Matthew Law + Seven Davis Jr., Captain Planet, Sly5thAve + Patrick Bailey, Blood Orange, Santigold, Peggy Gou, For Peace Band, Louis Cole, Maura Rosa, Te’amir, Troubleman + Nina Miranda, Machinedrum, Nickodemus + Jahdan Blakkamore, Maggie Rogers, Flamingosis + Birocratic and more. photo: Fish Eye Marine Park, Guam. | by Yu-Chan Chen. licensed under a Creative Commons Attribution-NonCommercial 4.0 International License. Our 8/1 show features music from Matthew Law + Seven Davis Jr. (Philly + Houston + Los Angeles), Captain Planet (Los Angeles + BK), Sly5thAve + Patrick Bailey (Pflugerville + BK + Los Angeles), Blood Orange (London + NYC), Santigold (Philly), Peggy Gou (Berlin + Korea), For Peace Band (Guam), Louis Cole (Los Angeles), Maura Rosa (Tijuana), Te’amir (Los Angeles), Troubleman + Nina Miranda (UK + Brasilia), Machinedrum (BK), Nickodemus + Jahdan Blakkamore (BK), Maggie Rogers (Maryland), Flamingosis + Birocratic (NJ + BK) and more. impulse travels. ep306. 25 july 2018.
impulse travels radio. episode 306. 25 july 2018.
featuring music from Jessie Reyez, Balún + Antibalas Horns, Armisticio, Useless Youth, Blancoscuro, Captain Planet, Jeon, Amber Mark, Sly5thAve + Patrick Bailey, Sango + Jean Deaux, Masego, D-Felic, Nickodemus + Innov Gnawa, Girl Unit + Kelela, Kool Customer, Gawvi + Lecrae, Blank Banshee, Weste, Lara Project, Mondo Grosso + Etsuko Yakushimaru and more. photo: Street Art Style Santiago. Chile. | by Geraint Rowland. licensed under a Creative Commons Attribution-NonCommercial 4.0 International License. Our 7/25 show features music from Jessie Reyez (Toronto), Balún + Antibalas Horns (BK + San Juan + NYC), Armisticio (Santiago de Chile), Useless Youth (CDMX), Blancoscuro (Mar del Plata), Captain Planet (BK + Los Angeles), Jeon (Aruba), Amber Mark (NYC + Benin City), Sly5thAve + Patrick Bailey (Pflugerville + Nigeria + Detroit + Los Angeles), Sango + Jean Deaux (Grand Rapids + Seattle + Chi), Masego (Jamaica + Newport News), D-Felic (Den Haag), Nickodemus + Innov Gnawa (BK + Morocco), Girl Unit + Kelela (London + D.C.), Kool Customer (Los Angeles + SF), Gawvi + Lecrae (Miami + Houston), Blank Banshee (Canada), Weste (Buenos Aires), Lara Project (Venezuela), Mondo Grosso + Etsuko Yakushimaru (Japan) and more. impulse travels. ep305. 18 july 2018.
impulse travels radio. episode 305. 18 july 2018.
featuring music from Mura Masa + Octavian, Odesza + Leon Bridges + Durante, Sinichiro Yokota, Jordan Rakei, Mondo Grosso + Aco, Onyx Collective, Both Face x Fyahbwoy, D-Felic, Niña Dios + Shigeto, Bibio, Henry Wu, Chancha Via Circuito, MHD + Wizkid, Ujica + Snail’s House, Cosmo’s Midnight + Woodes, Anavitoria + Atitude 67 and more. photo: La CaixaForum (Madrid). | by Jean-Pierre Dalbéra. licensed under a Creative Commons Attribution-NonCommercial 4.0 International License. Our 7/18 show features music from Mura Masa + Octavian (UK), Odesza + Leon Bridges + Durante (Seattle + Fort Worth + Los Angeles), Sinichiro Yokota (Japan), Jordan Rakei (Brisbane + UK), Mondo Grosso + Aco (Japan), Onyx Collective (NYC), Both Face x Fyahbwoy (Madrid + Barcelona), D-Felic (Den Haag), Niña Dios + Shigeto (Monterrey + Los Angeles + Ann Arbor), Bibio (West Midlands), Henry Wu (London), Chancha Via Circuito (Buenos Aires), MHD + Wizkid (Paris + Lagos), Ujica + Snail’s House (Tokyo), Cosmo’s Midnight + Woodes (Australia), Anavitoria + Atitude 67 (Araguaína + Campo Grande) and more. impulse travels. ep304. 11 july 2018.
impulse travels radio. episode 304. 11 july 2018.
featuring selections from this year’s Latin Alternative Music Conference + tunes from Odesza + Leon Bridges + AbJo, D-Felic + Honey Larochelle, Chico Mann + Captain Planet + Emynd, Jarreau Vandal + Luna Mae, Kool Customer, Baynk + Shallou, Mondo Grosso + Big-O, Chancha Via Circuito + Lido Pimienta, Marrón, Georgia Anne Muldrow, Branko + Miles from Kinshasa and more. photo: Alpandeire. Andalusia. España. | by Manuel Alqsar. licensed under a Creative Commons Attribution-NonCommercial 4.0 International License. Our 7/11 show features music from Odesza + Leon Bridges + Abjo (Seattle + Fort Worth), D-Felic + Honey Larochelle (Den Haag + Vancouver + Los Angeles), Chico Mann + Captain Planet + Emynd (NJ + BK + Los Angeles + Philly), Jarreau Vandal + Luna Mae (Nederland), Kool Customer (Los Angeles + Sf), Baynk + Shallou (Auckland + D.C. + Boston), Mondo Grosso + Big-O (Japan), Chancha Via Circuito + Lido Pimienta (Buenos Aires + Colombia + Toronto), Marrón (Acapulco), Georgia Anne Muldrow (Los Angeles), Branko + Miles From Kinshasa (Lisboa + London) and more. EMPANADAMN also brought us some selections from this year’s Latin Alternative Music Conference, featuring tunes from Mala Rodríguez (Andalusia), Girl Ultra (CDMX), DJ Bitman + Jesse Baez + Juan Ingarama (Chile + Chi + Guatemala), Ana Tijoux (Lille + Chile), PJ Sin Suela + Myke Towers (Ponce + San Juan), Cheo + Ulises Hadjis (Venezuela), Natos y Waor (Madrid), Systema Solar (Barranquilla), Delaporte (Napoles + Madrid), Carlos Cros (Barcelona) and more. impulse travels. ep303. 04 july 2018.
impulse travels radio. episode 303. 04 july 2018.
featuring music from Mondo Grosso + 大橋トリオ, Quantic y Los Miticos Del Ritmo, Onyx Collective, Soichi Terada, Rhye + Little Dragon, Chancha Via Circuito + Kaleema, Teleseen, Nickodemus + Alsarah, Molly Tigre, Super Tentemba Jazz, Thornato and more. photo: Buenos Aires railway bridge with graffiti. | by Ralf Steinberger. licensed under a Creative Commons Attribution-NonCommercial 4.0 International License. Our 7/4 episode features music from Mondo Grosso + 大橋トリオ (Japan), Quantic y Los Miticos Del Ritmo (UK + Colombia), Onyx Collective (NYC), Soichi Terada (Japan), Rhye + Little Dragon (Los Angeles + Sweden), Chancha Via Circuito + Kaleema (Buenos Aires), Teleseen (BK), Nickodemus + Alsarah (BK + Sudan), Molly Tigre (BK), Super Tentemba Jazz (Mali + Côte d’Ivoire), Thornato (QNS) and more. impulse travels. ep302. 27 june 2018.
impulse travels radio. episode 302. 27 june 2018.
featuring special guest MR. TIPTON [ Turntable Lab ], who blessed us with an all-vinyl live IMPULSE MIX of African heat and other international gems. photo: art installation at houston museum of fine arts. | by garagemonster. licensed under a Creative Commons Attribution-NonCommercial 4.0 International License. Our 6/27 episode features special guest MR. TIPTON [ Turntable Lab ], who blessed us with an all-vinyl live IMPULSE MIX of African heat and other international gems. The show also features tunes from Georgia Anne Muldrow (Los Angeles), Astrud Gilberto (Brasil + NYC), Nickodemus + Fémina (BK + San Martín De Los Andes), Nikki Jean + Lupe Fiasco (St. Paul + Chi), Empresarios (D.C.), King Most (BK + BX + SF) and more, plus a special tribute to our Houston roots. You can check out Mr. TIPTON’s live mix below featuring tunes from Gboyega Adelaja (Nigeria), Innov Gnawa + Mr. Assister (BK + Morocco + London), King Sunny Ade + Adesse Versions (Nigeria + Manchester), Ebo Taylor (Ghana), Bell’a Njoh (Cameroon), Stephen Encinas (Trinidad and Tobago), Voilaaa (France), Ikebe Shakedown (BK), Jimmy Hyacinthe + DJ Vas (Côte D’ivoire + Paris), Alma Negra (Basel), Cos-Ber-Zam + Daphni (Togo + Dundas + London), The Twins (Nigeria) and much more. impulse travels. ep301. 20 june 2018.
impulse travels radio. episode 301. 20 june 2018. Seventh-anniversary all-mix special featuring a broken beat mix and a house mix by DJ LIL TIGER + a multi-genre live mix from EMPANADAMN. For our 6/20 episode, we celebrated our seven-year anniversary at WHCR with a four-hour-+ all-mix show. DJ LIL TIGER started with a classic Broken Beat mix with some UKG flourishes, followed by an EMPANADAMN multi-genre live mix. LIL TIGER closed out the show with a House set with some Latin and African touches. You can listen to LIL TIGER’s broken beat mix below featuring tunes from Omar (UK), Seiji + Lyric L (London), Vikter Duplaix (Philly), Donae’o (London), Mark De Clive-Lowe (London + New Zealand), Crazy Cousinz (UK), Small Arms Fiya + Ayah + Domu (UK), Daz-I-Kue + Bembe Segue + Colonel Red (London + ATL), Jovonn (NYC), Bunny Mack + Bugz In The Attic (UK) and more. Check out EMPANADAMN’s live mix as well, featuring tunes from Konshens + Major Lazer (Kingston + Los Angeles + ATL), DJ Jazzy Jeff + The Fresh Prince + Terry Urban (Philly), The Avalanches (Melbourne), Shakka + Alunageorge (London), Celia Cruz + Bounz (Havana + Los Angeles), Golden Kong (São Paulo + BK), Héctor Lavoe + Willie Colón + DJ Baysik (Ponce + BX), Robert Owens (Ohio + Chi), Sinden (London) and more. LIL TIGER’s house mix features songs from Black Coffee + Zakes (South Africa ), Klaves (Poland), DJ Fudge + Hallex M + Tasita D’mour + Renato Xtrova (Hong Kong + London + Angola), Kllo + Mall Grab (Australia + London), Mastiksoul + Yuri Da Cunha (Portugal + Angola), Mr V + Copyright (NYC + UK), Mastiksoul + Yuri Da Cunha (Portugal + Angola), Gregor Salto + Mokoomba (Haarlem + Zimbabwe), Fulanito + Sabo (NYC), Doc Link + Marissa Guzman (Chicago + Detroit) and more. impulse travels. ep300. 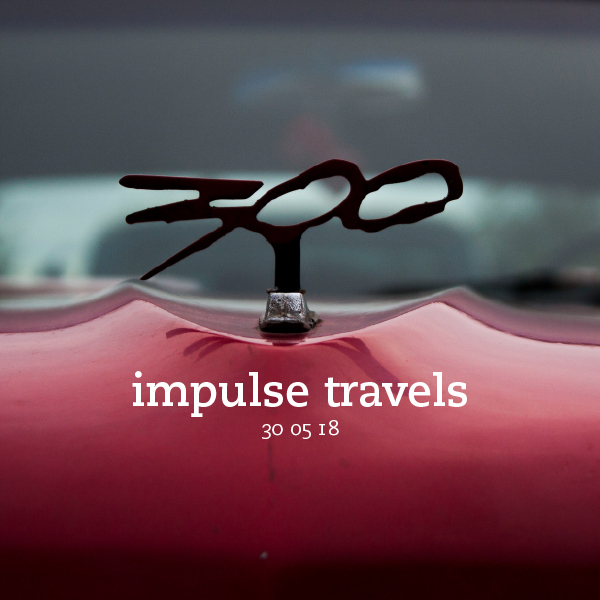 30 may 2018.
impulse travels radio. episode 300. 30 may 2018.
celebrating our 300th show with tunes from Tiwa Savage + Wizkid + Spellz, A Boogie Wit Da Hoodie + Davido, Olamide + Wizkid, Tekno, Soichi Terada, Omar, Empresarios, Wande Coal, Molly Tigre, Ir Sais, Brownout, Nickodemus + Innov Gnawa, Nu Guinea, Fish Go Deep, Klaves, Bob Moses and more. photo: Chrysler 300. | by Hannes. licensed under a Creative Commons Attribution-NonCommercial 4.0 International License. The 5/30 episode, our 300th show since starting at WHCR in 2011, features tunes from Tiwa Savage + Wizkid + Spellz (Nigeria), A Boogie Wit Da Hoodie + Davido (NYC + Nigeria), Olamide + Wizkid (Nigeria), Tekno (Nigeria), Soichi Terada (Japan), Omar (UK), Empresarios (D.C.), Wande Coal (Nigeria), Molly Tigre (BK), Ir Sais (Aruba), Brownout (ATX), Nickodemus + Innov Gnawa (BK + Morocco), Nu Guinea (Napoli + Berlin), Fish Go Deep (Cork), Klaves (Poland), Bob Moses (Vancouver) and more.